Music is self-expression at its best. That said, there’s no better way to express your love for the environment than strumming on a guitar made from recycled products! Two brilliant conceptualizers, Adam and Shaun Lee, came up with Bohemian Guitars, a startup that transforms waste oil cans into electric guitars. Having grown up in Johannesburg, the duo was inspired by the resourcefulness of residents in South African townships and aren’t strangers to repurposing waste materials into playable instruments. Made from recycle oil cans, these guitars sure as hell are funky and completely unconventional. But that isn’t all. Contrary to what you’re thinking right now, these instruments actually do sound as good as a regular electric guitar too! 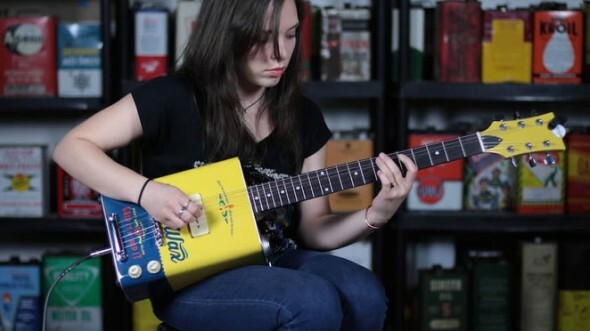 “Bohemian Guitars mission is to build funky, unique and functional instruments out of oil cans for real, everyday use,” says the company. Currently, the guitars made from oil cans are available in four different types, priced at $299.